Now that I have your attention, you are probably shivering at the thought but there is no need to undress. The plants, trees in this case, are already in their bare form and if you can brave the cold this time of year and have the desire to increase your identification skills there are many opportunities to do so. I took a course in ornamental tree identification many years ago as part of my college curriculum. I loved it. When I saw in the Audubon brochure that there was a tree identification class available this past Saturday I decided to attend. My previous course covered ornamental trees and shrubs which did include some natives but I feel that my skills at identifying those trees along the roadside are not what I would wish them to be. I do know many of the woodland trees but some I just can't identify. Winter tree identification has a language all its own. Bud scales, bud scar, leaf scar, pith, lenticel, growth rings and then there are the buds themselves. Are they clustered or single? Sticky, smooth or velvety? Much of this course was review for me at least with the terminology but it is challenging to re-acquaint oneself with those terms. I have quite a few books to help me in my cause. Gray's Manual of Botany is a wonderful key if you know all of the language. Years ago I bought Native Trees, Shrubs and Vines for a class and never used it. It cost $79.00 twenty years ago and it is a wonderful book whose time has finally come. I also own three of Michael Dirr's books. His Manual of Woody Landscape Plants is still used by many college students. Seeing Trees is a gorgeous book on trees written by Nancy Ross Hugo with photographs by Robert Llewellyn. It is informative, fun to read and the photographs are incredible. No Kindle or Nook would properly do them justice. I usually start with the basic outline of the tree and then move on to the bark. A closer view of the tree's branching structure will show if the branching is opposite or alternate. There are fewer genus of trees exhibiting opposite branching than alternate. Maple, Ash, Dogwood, Horse chestnut and those in the Caprifoliaceae family all have opposite branching. The bark of an ash is deeply furrowed and quite beautiful while that of the paper birch can easily be identified by the sheets of peeling white. I have many different types of oaks on my property. White oak and pin oak along with some red oak. The pin oaks are easy to spot as their lower branches dip toward the ground while the basic form of the tree is pyramidal. Trees are quite beautiful in their nakedness. Many have buds which are quite distinctive. Most of us can identify a flowering dogwood from the fat flower bud. The Tulip tree has this distinctive seedhead. Every endeavor requires one to start at the beginning and no matter what your skill level there is always a new plant to learn. I would bet that Michael Dirr would know all of the trees on my property but for the rest of us there would be something new around each corner. Do you have any desire to know your neighborhood trees? It would be fun to learn together. The usual slow pace of decline in the garden is fast forwarded when you are away from it for any length of time. Usually, October is brilliant but the autumn colors are less than dramatic here this year. Perhaps it is relative and I am unfairly comparing them to the brilliance of the trees in Maine which I saw the first of the month. The seasonal change in leaf color can spice up the garden as flowers wane. The first heavy frost occurred just a week ago and morning temperatures are finally chilly. Having been away for a good part of the month, all that is left blooming is the very late 'Pink Sheffield' mums along with Eupatorium 'Chocolate' and a couple Knock out rose blooms. I do see some color on the delphinium in the upper garden but that is another story. The garden needs a good cleanup as the leaves fall and cover everything with their uniform brown. Most of the trees closely surrounding my garden are oaks while the outer perimeter is ringed with white pine. White pines are very shallow rooted and not a great choice when planted in close proximity to a garden. They are a softwood evergreen and the native white pine, Pinus strobus, is very large. Oaks are more desirable for my garden as they give great shade, are deeply rooted and can be pruned up for more light. They are, however, very stubborn about giving up their leaves. The leaves start to fall in October and they continue to drift to the ground right through the winter. The abscission layer of oak leaves is stubborn and fails to fully mature uniformly. Some leaves wait to fall until spring growth begins. They settle on the garden through the fall and winter like dust on the bookshelves requiring weekly attention if the garden is to look tidy. Not so the white pines. The white pine woods are cleaning themselves. A new layer of pine needles have been shed and they cover the ground with a uniform sprinkling of cinnamon. This soft layer of needles muffles the sounds of the wildlife and not so wild life. Plush as a Persian carpet, the woodland paths are inviting me in to take a walk. The swamp is a varied and interesting ecosystem. I try to take a walk down to the swamp at least a couple of times a week. Everything changes so quickly! 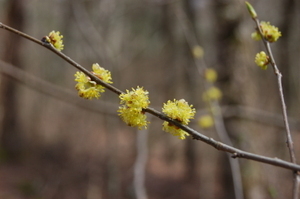 The canopy is bare but for the flowers of the Common spicebush, Lindera benzoin, which are a beautiful acid yellow. They light up the swamp with a firefly like glow. The spicebush is a common marsh dweller and when the stem is crushed a spicy odor is emitted, hence the name. The floor of this outdoor room is littered with another odoriferous occupant, the skunk cabbage, Symplocarpus foetidus. 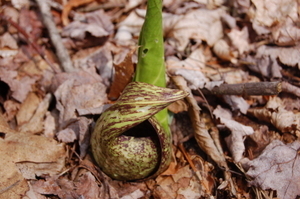 No doubt about it, it does smell like a skunk but the color of the familiar spathe which covers the spadix is lime green with mottled burgundy. No interior designer can do better! The lush emerald green leaf is cool and inviting at least until you get a whiff! 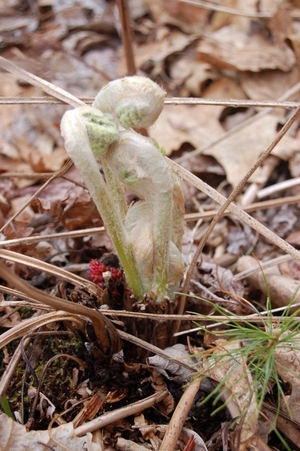 One of the most interesting emerging plants is the ostrich fern, Matteuchia struthiopteris, which emerges from the ground with a cottony covering over an embryonic looking frond. There is always time for a walk in the woods especially when the back gives out from raking, compost hauling and dividing. 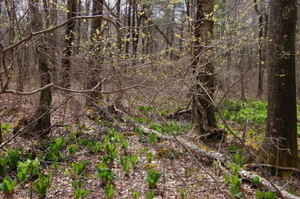 Even the foetid smell of the skunk cabbage rejuvenates the spirit as the cycle of swamp life continues! 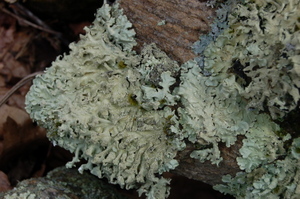 I don't have a picture of the moss which I so love but here is one of some lichens on the rocks. They are beautiful aren't they?